There is really no reason to buy grape tomatoes from the market when you have the option to grow them at home and get a constant supply of fresh vegetables. When purchased at stores and markets, grape tomatoes can be fairly expensive – however, you can grow them at home by starting them from seeds. Grape tomatoes do require a lot of work to grow and plant, but they are worth the effort and wait. Plant the grape tomato seeds indoors at least eight weeks before the last frost date. Add a commercial seed starting soil to a planting tray, and plant the seeds 2 inches apart. Cover the seeds with ¼ inch of soil. Place the planting trays on a seed mat that will maintain a temperature of 70 to 90 degrees F. Place the tray in a warm location if you do not have a seed mat. Remove the grape tomato seeds from the mat once they have sprouted and place them 2 to 4 inches under the bulb of a grow light. Leave the grow light on for 18 hours each day until the seedlings grow two sets of leaves. Transplant the seedlings into their own 4-inch containers. Once daytime temperatures stay between 60 to 70 degrees F and the night temperature stays around 55 degrees F, place the seedlings outdoors for one to two hours a day. Slowly increase the time period for which you place them outdoors to help them adjust to the temperature and weather. Once you can place the seedlings outdoors for six hours a day, you can plant them in your garden. Use a tiller to turn the top 10 to 12 inches of the soil in the planting area. Combine 2 to 3 inches of compost with the soil. Dig a hole in the ground that will allow you to plant each tomato seedling into the ground up to the second set of leaves. Water the seedlings until the soil is moist, and then give the plants 1 inch of water a week. Add fertilizer to the tomatoes every two to three weeks. 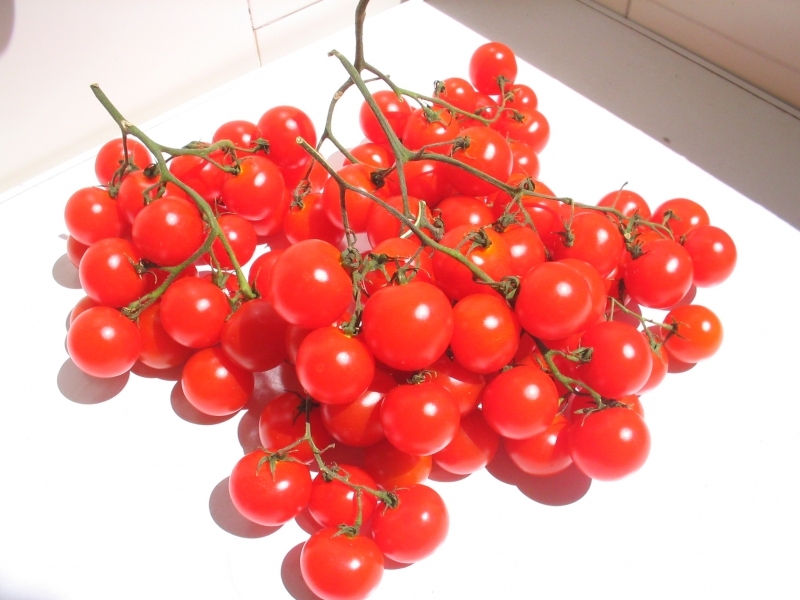 Use a fertilizer formulated for tomatoes, and apply at the rate suggested by the manufacturer. Place a tomato cage over the grape tomatoes to support indeterminate plant vines. Do this before vines begin crawling to prevent harming the roots. Harvest the grape tomatoes when they feel firm. They will appear plump and red when ripened. Keep them in a cool and dry location until ready for use.